You'll beWITCHED! You'll beDAZZLED! You'll be swept into a world of enchantment BEYOND ANYTHING BEFORE! Bedknobs And Broomsticks is a delightful Disney production that combines live-action and animated sequences. A novice witch aids the British forces during WWII with the help of her young sidekicks. Along the way, they travel to a mystical land inhabited by talking animals where they must take possession of an amulet that holds the key to defeating the bad guys. • “Dylan and Cole Sprouse: Blu-ray Is Suite! Many people view 1971’s Bedknobs and Broomsticks as a poor cousin to Mary Poppins, and the comparisons between the two are quite logical. Both are musicals in which a) a magical woman cares for - and straightens out - some mildly problematic kids and b) animation is combined with live-action footage. 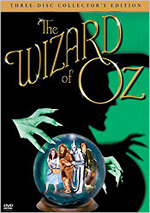 Both films were directed by Robert Stevenson, written by Bill Walsh and Don DaGradi, and featured songs by the Sherman brothers. 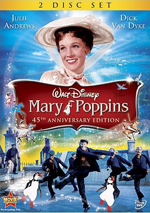 Indeed, the two projects have so much in common that when the production of 1964’s Poppins looked iffy due to rights questions, Bedknobs was prepped as its alternate. Obviously things went forward with Poppins, so Bedknobs had to remain in the bullpen for another seven years. When it appeared, it did decently except for the ignominious fate of those inevitable comparisons. While I still can’t say they aren’t warranted, Bedknobs nonetheless deserves positive attention of its own, for it’s actually an entertaining and winning film. In 1940, German bombings threaten the safety of London residents, so the city’s children are shipped to the country to keep them from the danger. Despite her protestations, eccentric single woman Eglantine Price (Angela Lansbury) takes in three kids: oldest Charlie (Ian Weighill), middle Carrie (Cindy O’Callaghan), and youngest Paul (Roy Smart). They aren’t too eager to be with her either, and - spurred by cynical little Charlie - they immediately hatch a plan to escape back to London. However, the kids - and the audience - soon learn that Miss Price is no ordinary spinster. Indeed, she’s a full-fledged witch, or at least a trainee who still needs to finish a lesson or two from her correspondence course. In any case, the kids decide to stick with Eglantine, largely because Charlie figures he can blackmail her; the other two - especially Paul - seem more eager to have a stable place to stay. Apparently due to wartime concerns, Professor Emelius Browne (David Tomlinson) doesn’t send Eglantine’s final lesson, so she uses her traveling spell to whisk the kids and herself to London to find him. Method of transportation: bed, as operated by the knob. (Hence part of the movie’s title; the “broomstick” only comes into play a couple of times during the film and it less important than the “bedknob”.) Once there, they find Browne and embark on a journey to discover the secret to “substitutiary locomotion”, a spell that Eglantine hopes will sway the war effort to the side of the Allies. One way in which Bedknobs differentiates itself from Poppins stems from its storyline: it actually has one. Poppins was more a conglomeration of different episodes linked together by the overall theme, whereas in Bedknobs, the film always goes forward in search of that “subtitutiary locomotion” spell. Granted, it takes about 800 sidetrips along the way, so Bedknobs will never be accused of being a terribly plot-driven movie, but at least it attempts to create a coherent narrative. Many Disney films from this one’s era feel like little more than compendiums of unrelated skits, so it’s nice to see a flick that tries to form a true story. Also in the “positive” category are the cast of Bedknobs. While none of the adult actors truly distinguish themselves, they seem more than adequate for the roles. However, I must note that Roddy McDowall appears wasted as Mr. Jelk, the local vicar. He has little to do and shows no obvious reason for existing at all; the character could have been completely cut from the movie and no one ever would have noticed. I was rather impressed by the children of Bedknobs, or at least the boys. Middle children usually get the shaft, and Carrie’s no exception, as poor O’Callaghan doesn’t get to do much in the film. As wily Charlie, Weighill provides appropriate levels of duplicity and cynicism, and Smart offers a charming but not excessively saccharine portrait of innocent little Paul. British child actors usually seem much more believable and “normal” than American kids; the Brits often lack many of the cutesy and cloying qualities of our tots, which makes them much more enjoyable to watch. These kids add a lot to the film and give it an edge it easily could have lacked. As for the remainder of the production, it seems eminently adequate. The quest for the magic spell becomes exceedingly muddled along the way, as it gets bogged down by side treks and musical numbers. The latter were a minor nuisance in my opinion. About a half an hour passes in Bedknobs before we hit the first true musical bit, but after that, the tunes come at a more rapid pace, and some of them go on too long. I feel the story is confused enough as it was; the song and dance bits just make matters really drag. Still, the songs themselves aren’t bad. The Shermans didn’t outdo themselves here, but the tunes are generally tolerable and don’t bother me too much. For me, the only number that really wears out its welcome is “Portobello Road”, as it simply goes on forever. Otherwise, the songs are concise enough to remain acceptable. Ironically, “Portobello Road” wasn’t always such an extended piece. The DVD of Bedknobs represents its “restored” length of 140 minutes. For many theatrical exhibitions, it was cut to 117 minutes, but the 25th anniversary laserdisc brought it back to the original running time. It seems unclear whether Bedknobs lasted 140 minutes in 1971 showings but was shortened in a later reissue, or if the longer version never appeared on movie screens, even in 1971; different sources state different things. In any case, the DVD does provide the film as originally intended, for better or for worse. Granted, I only saw the shorter cut as a very little kid, so I can’t say which I find superior. I just could have lived without the longer version of “Portobello Road”. In any case, most of Bedknobs and Broomsticks provides a fun excursion. It doesn’t belong among the best Disney have to offer, but it’s generally entertaining, and considering the poor quality of most Seventies work from the studio - such as the abysmal Pete’s Dragon - “generally entertaining” is more than acceptable. 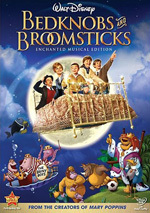 Bedknobs and Broomsticks appears in an aspect ratio of approximately 1.66:1 on this single-sided, double-layered DVD; the image has been enhanced for 16X9 televisions. This was a flawed but acceptable presentation. Sharpness varied. Much of the film showed pretty good delineation, but more than a few shots came across as a bit soft. Those weren’t extreme examples, though, and the majority of the flick looked positive. No issues with jagged edges or shimmering appeared, and edge enhancement was minor. Source flaws were a somewhat different issue, partially due to all of the film’s effects work. Bedknobs required a lot of compositing, so expect heavy grain. However, I couldn’t solely blame the effects, as even non-effects shots often suffered from heavier than usual levels of grain. That made this a murky presentation at times. I also noticed mild to moderate instances of specks and marks. Again, these tended to mostly affect effects shots, but they popped up sporadically in non-effects elements as well. Due to the graininess of the image, colors tended to be erratic. At times, they demonstrated good vivacity, but all that grain usually meant that they were somewhat muddled. Blacks were reasonably dark and deep, while shadows came across as acceptable at best. Once more, the grain created concerns, as low-light shots tended to seem a bit flat and messy. Overall, the image was satisfactory, especially given all of the presentation’s potential pitfalls, but it wasn’t a great-looking film. I felt a little happier with the Dolby Digital 5.1 soundtrack of Bedknobs. The soundfield presented a modest environment, but it seemed fine for a film of this vintage. Mainly it was music that benefited from the multi-channel treatment, and the songs and score indeed offered decent stereo separation. The music also was slightly bolstered by the surround speakers. Otherwise, I heard some modest side and rear channel spread to the effects - most of which occurred during the soccer sequence - but most of these elements stayed anchored in the center. Audio quality seemed typical for the period but presented no serious problems. Actually, dialogue displayed the biggest concerns, mostly due to the restored material. A number of speech stems apparently became lost, so these lines were dubbed for the film’s 25th anniversary. Some of the original participants - like Angela Lansbury and Roddy McDowall - did their own parts, but different actors performed others. Most notable among these was the substitution for David Tomlinson. All of the dubbed lines were easily noticeable, but Tomlinson’s were the worst, for the replacement actor sounded very little like him. I understand the need for newly recorded speech to restore the movie to its original length, but I think they could have better cast the parts. Otherwise, speech appeared a bit thin and flat, but dialogue was consistently clear and intelligible, even in the face of the various accents. Effects were also somewhat dull and they generally lacked dynamic range; I heard a little rumble during the soccer game, but that was an exception. Nonetheless, the effects came across as acceptably clean and accurate for the era. Music seemed a bit brighter and more engaging, though the songs and score also failed to transmit much depth. In the end, the quality of the audio was average for its period, but the musical soundfield brought up my grade to a “B-”. 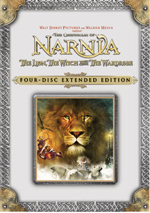 How did the picture and audio of this 2009 “Enchanted Musical Edition” of Bedknobs compare to those of the original DVD? Unfortunately, I don’t own the old disc and I couldn’t find a copy to rent, so I was unable to directly contrast the two releases. If you look at my review for the prior disc, you’ll find higher grades and more praise. Don’t take that to mean the 2000 DVD is superior to the 2009 release. In fact, I’d bet that both offer virtually identical visuals and audio but changes in my home theater set-up and my viewing standards have changed over that span. It’s a disappointment that the quality of the 2009 DVD doesn’t seem to improve on its predecessor, though. This “Enchanted Musical Edition” of Bedknobs and Broomsticks mixes old and new extras. First up is Music Magic: The Sherman Brothers, a featurette that apparently ran on the Disney Channel. This 11-minute and 27-second program mainly chats with the Shermans as they discuss their music for the film, with a primary focus on songs cut from the original release. In addition, we learn more about the production from Angela Lansbury, and the piece also offers a nice mix of production art and behind the scenes footage. It’s a solid little piece that included some good information about the movie. One fun snippet appears in the guise of a David Tomlinson Recording Session. This 70-second clip shows Tomlinson as he croons a few bars of “Portobello Road” with the guidance of arranger/conductor Irwin Kostal. It’s a neat look at this element, though unfortunately the original audio doesn’t survive. Instead, the finished track is played over the piece, so we can’t hear the short discussion between Kostal and Richard Sherman at the end. Still, it’s a cool addition to the disc. ”A Step In the Right Direction” Reconstruction attempts to rebuild a deleted scene from the film. The audio for the song “Step” still exists, but only still photos of the production remain. As such, this three minute and 45 second piece plays the tune on top of these snapshots. The song did little for me, but I was happy to see the inclusion of this effort. For something new, we shift to The Wizards of Special Effects. Hosted by Disney Channel actor Jennifer Stone, the eight-minute and seven-second show features comments from Disney historian Les Perkins, visual effects historian Greg Kimble, and visual effects supervisor John Allison. They tell us a little about the effects of Bedknobs and compare them to more modern techniques. We get a smidgen of good info here, but the program usually feels more like a promo for Stone’s series. We get four theatrical trailers for Bedknobs, the first three of which seem to have accompanied the movie’s initial release in 1971. While the fourth doesn’t mention a reissue, I have the feeling it does come from a later re-release, especially since it plays off of the famous “you’ll believe a man can fly” tagline of 1978’s Superman. Dylan and Cole Sprouse: Blu-Ray Is Suite! runs four minutes, 45 seconds. Here the Disney channel stars and their TV mom Kim Rhodes do their best to sell us on Blu-Ray. Yes, it’s just an ad – and a really tacky one at that. A few ads open the DVD. We get clips for Snow White and the Seven Dwarfs, The Princess and the Frog, and SantaBuddies. These also appear in the Sneak Peeks area along with promos for Tinker Bell and the Lost Treasure, Blu-ray, Like Stars on Earth, Up, D23 and Disney Movie Rewards. Does the 2009 DVD lose anything from the prior disc? Yup. It drops two vintage cartoons, “Film Facts” text production notes, and some still galleries. Also, it appears the this disc includes a shorter version of “Music Magic”. It’s too bad the 2009 DVD drops so many components from its predecessor, especially since it only adds one new featurette. Despite my less-than-enthusiastic general opinion of Disney’s live-action films, I found Bedknobs and Broomsticks to provide an entertaining experience. The movie featured a muddled but fun narrative plus some positive performances to create an enjoyable movie. The DVD offers acceptable picture and audio plus a smattering of often minor extras. This is an entertaining flick but the DVD disappoints, especially for fans who already own the original release. The 2009 version doesn’t appear to provide improved picture and audio, and it changes supplements in a negative way; we get one minor new featurette but lose other components. If you don’t already own Bedknobs on DVD, grab this one, but it’s not worth a double dip.